I feel like Don Quixote. I am fighting illusions. And the illusion I keep fighting is the one that critics keep bringing back – is what I do, dance? The battle between a traditional establishment and an experimental approach is nothing new. From the times of an Adi Shankaracharya or Jesus Christ, we can count any number of people that questioned an establishment. Of course, for every name that stood tall, there were also hundreds that were squashed by the establishment. In a strange way, in my attempt to popularize a dance form, I sometimes face a wall, the wall of the establishment that believes that any change needs to be obliterated or pushed under the carpet. What cannot be squashed is best marginalized. The technique works extremely well in maintaining the status quo and refusing to acknowledge that it is Pyrrhic victory, if at all. After the stupendous encores I received at the end of my recent premiere of ‘The Prophet’ in Bangalore, as always I heard a couple of dissonant voices. They did not come from the audience, they came from ‘critics’. Critics that believed that the Bangalore audience was not enlightened as an overseas audience might be! But that’s another story. That there is dissonance is not a problem, in fact it is good. But the criteria behind the dissonance is what I hope to dissect. 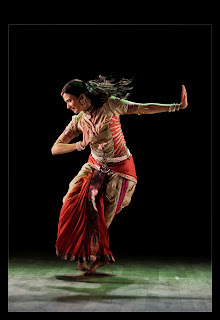 And the one that I wish to take up now are the comments that there was ‘not enough Nrtta’ (pure dance) and this is ‘theatre and not dance’ (and therefore not a revolution in dance, ergo Bharathanatyam rests safe with no challenges). In a traditional concert the audience hears a clear ‘on your mark, get set, go’ before the Nrtta (pure dance) movements start. These are heralded using specific sollukattus (rhythmic phrase), swara passages (musical notes), or distinct English announcements that imply that ‘real’ dance or Nrtta starts now! The sum total of all total Nrtta elements across an entire Margam (traditional repertoire) performance averages 35 minutes in a 75 minute concert. In a show like ‘The Prophet’ or ‘YUDH’ there are no clarion calls announcing that a dance/Nrtta unit is about to begin. The entire experience is woven into one uninterrupted story. The total number of minutes of 'Nrtta' in ‘The Prophet’ is 29 minutes and 09 sec, in a show that lasts 65 minutes. It is fairly elementary arithmetic to figure out which had more Nrtta, the traditional, or ‘The Prophet’. The reason people do not register it as a separate experience of Nrtta in ‘The Prophet’ is purely a perception conditioned by two centuries of how Nrtta is pre-announced in traditional concerts. It would be easy for traditionalists to marginalize ‘The Prophet’ as theatre and not dance. Fact is, this is dance, not theatre. This was loved by the audience, and this was not boring. Not my words, but words of the common people that attended the performance. And I am for ever humbled by their opinion.